The pretty little island of Ko Samet is located on Thailand’s Eastern Seaboard and makes for a great escape from the often frenetic atmosphere of nearby Bangkok and Pattaya. 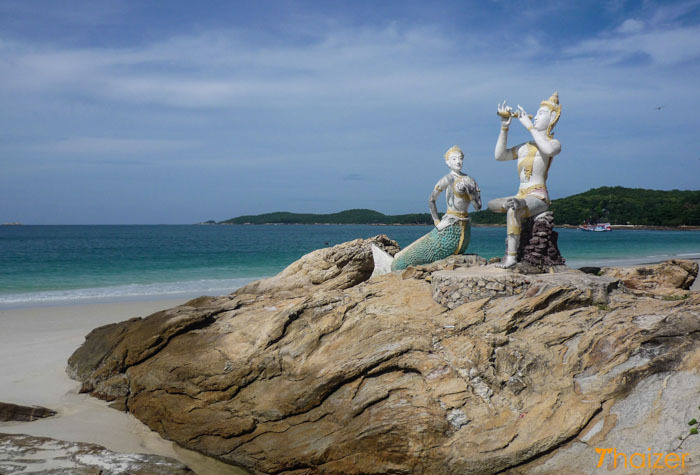 Ko Samet’s proximity to the Thai capital makes it extremely popular as a weekend getaway spot. Nearly all of the island’s beaches are located on the east coast with the main exception being Ao Prao (known as Paradise Beach) on the west coast. The nearest beach to Na Dan pier is Hat Sai Kaew, famous for its luxurious white sand. This beach is probably the most developed on the island and is certainly the busiest. Hat Sai Kaew has the image of being Ko Samet’s ‘party central’ attracting an eclectic mix of foreign backpackers, Thai youngsters and Bangkok holidaymakers. Ao Tub Tim is a good choice for somewhere a bit quieter, but still close enough to other beaches so as not to feel too isolated. For those looking for more seclusion, try Ao Tub Thian which is known as Candlelight Beach. If you’re thinking of visiting at the weekend or on a public holiday, I would advise booking accommodation in advance. Ko Samet’s popularity does come with some environmental cost as borne out by the piles of unsightly rubbish that are allowed to accumulate, notably near to the main pier at Na Dan. The island does have protected status as part of a national marine park* and it’s a shame that authorities haven’t done more in recent years to prevent the dumping of rubbish. That aside, the island is still very attractive and is relatively easy to get to from both Bangkok and Pattaya. *Thailand raises an entrance fee to all its designated national parks. Currently, that fee is 40 Baht for Thai nationals and 200 Baht for foreigners (half-price for children). The national park booths are located close to both piers and as you pass through them en route to the beaches the fee will be collected. Buses depart hourly from Bangkok’s Eastern Bus Station (Ekamai) and go directly to Ban Phe which is the mainland departure point for the 40-60 minute ferry crossing to Ko Samet. Journey time from Bangkok to Ban Phe is approximately 3 hours. Any tour operator in Bangkok can also make travel arrangements for you. From Pattaya it is also a case of heading for Ban Phe, although this usually entails going via bus to Rayong and then taking a songthaew to Ban Phe (you can also use this same option from Bangkok). Again, any Pattaya tour operator can arrange transport and/or accommodation. Most ferries arrive at Ko Samet’s main pier at Na Dan, but there are also other arrival points such as Ao Wong Duan. Ko Samet enjoys its own micro-climate and avoids the worst effects of the rainy season that can affect mainland Rayong province. Of course, that doesn’t mean that it never rains! But statistically at least, the island has a drier time of it during the May-July rainy season than most parts of Thailand.